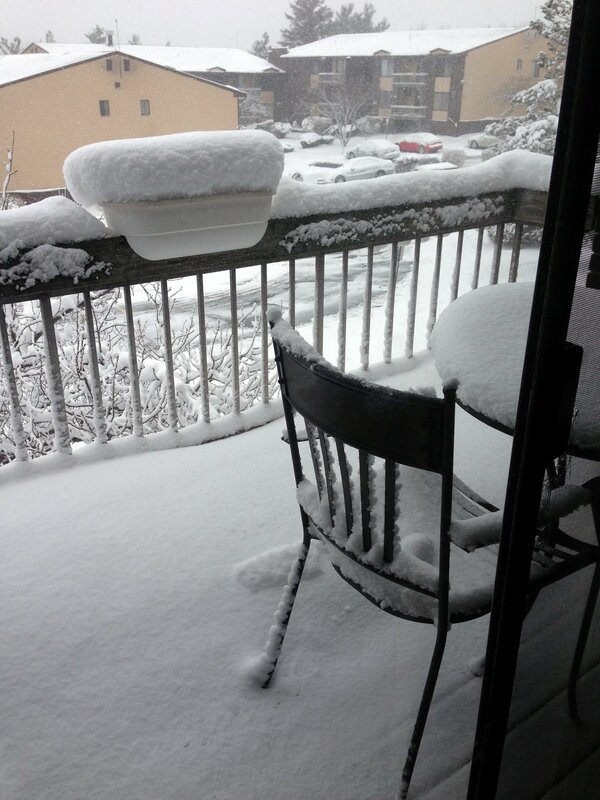 Is it mid-March already? This year is FLYING by! 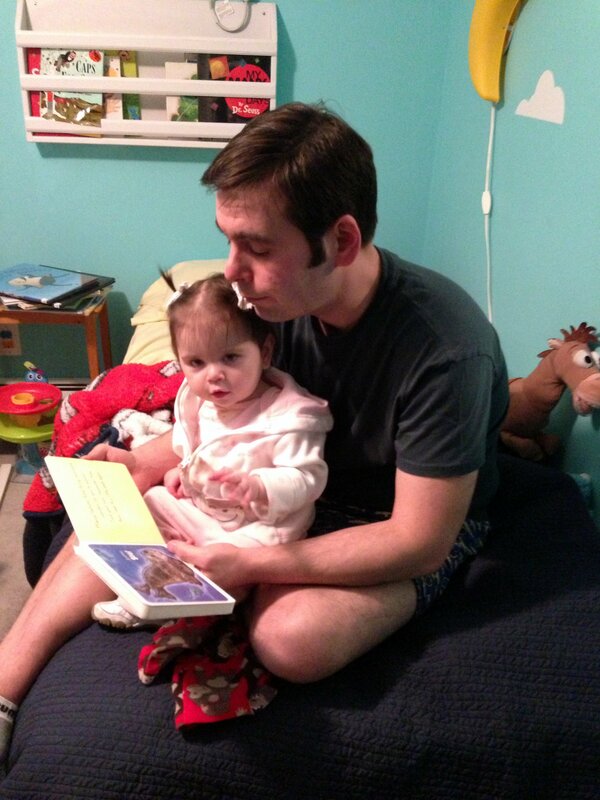 Today is my 14 monhtday, so we’ll have a milestone post later in the week… maybe! 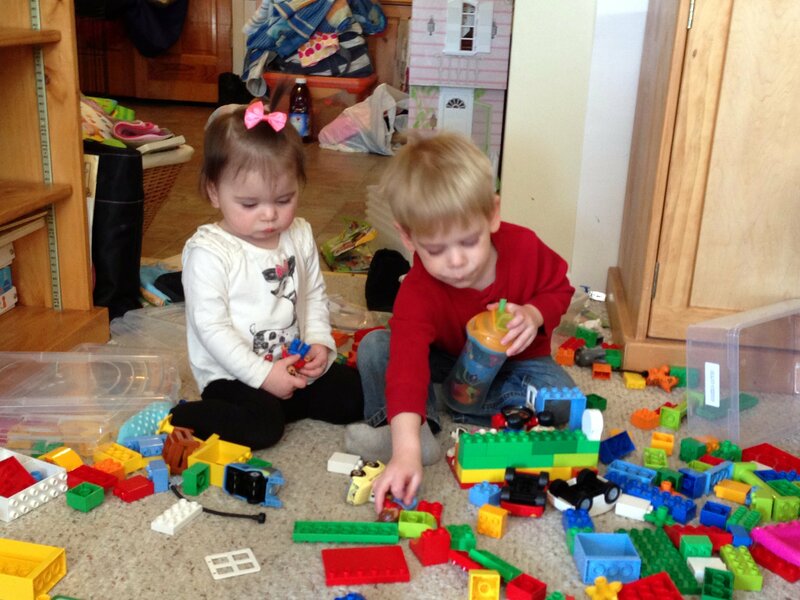 Our schedule looks pretty full, and Mommy’s not feeling great so she probably won’t be staying up too late to do our typing. If it’s Sunday, Cole must be at a birthday party. Also? 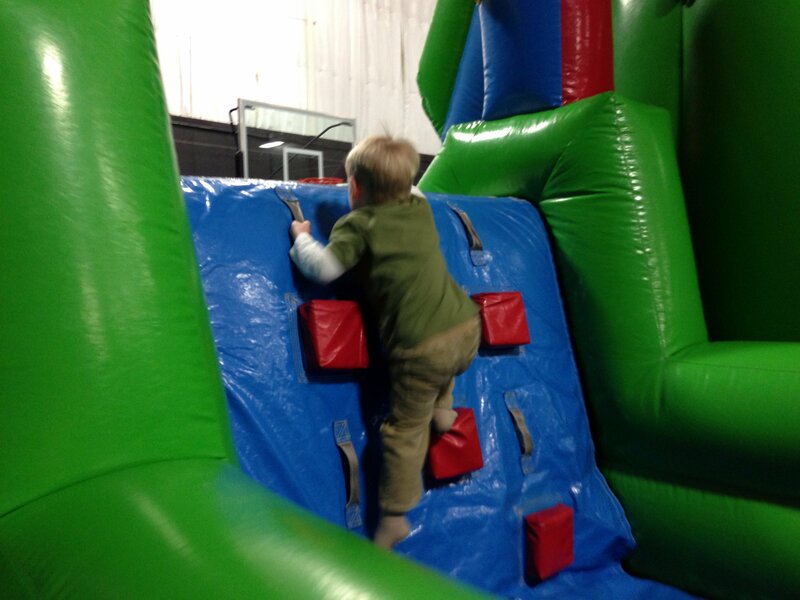 He really likes climbing. He is a monkey. I was a little cranky this week. 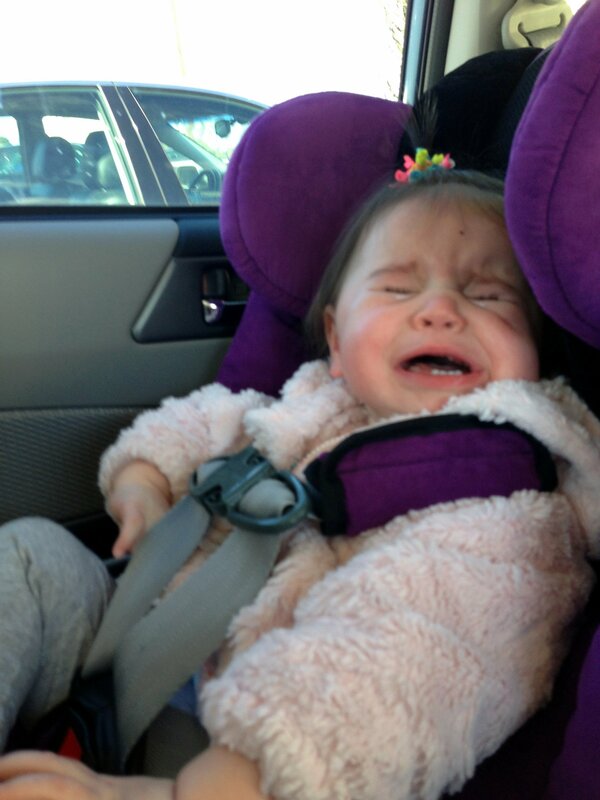 Maybe teething a little bit? 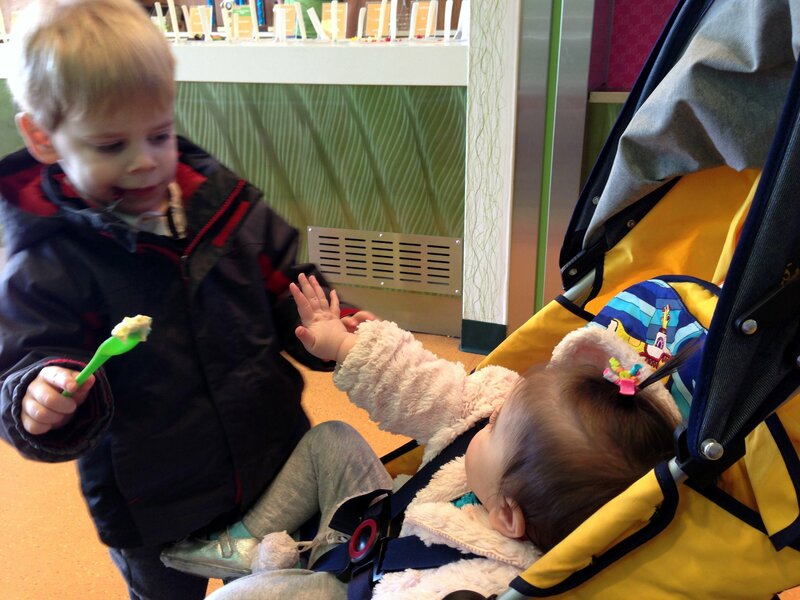 After school on Monday, we had frozen yogurt at 16 Handles. 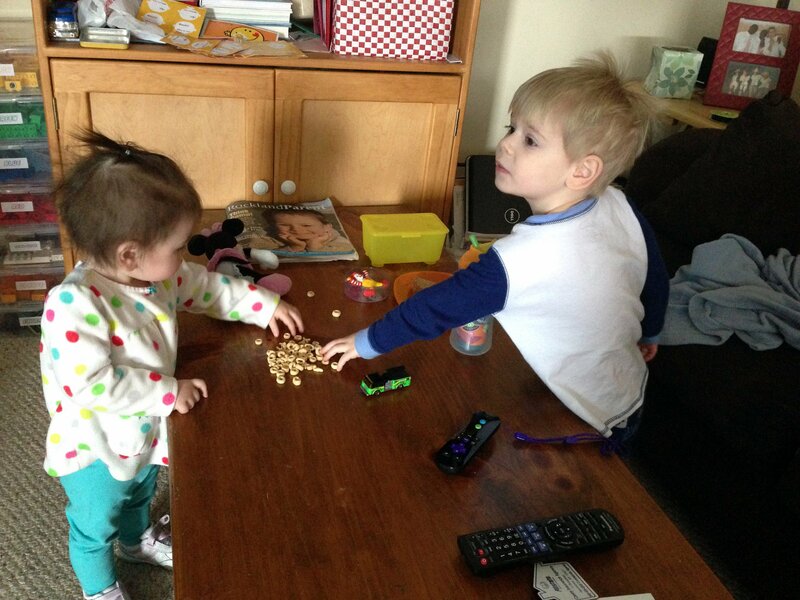 Cole is a pretty good sharer sometimes. 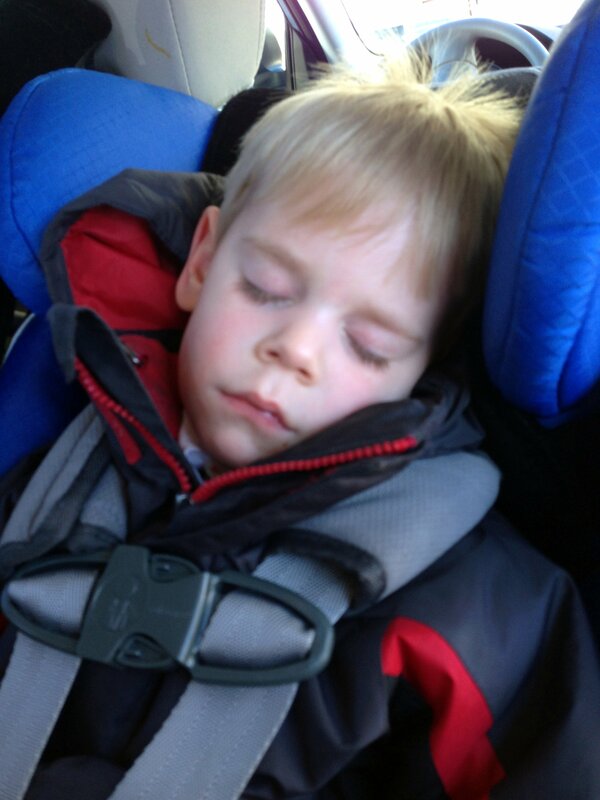 Cole fell asleep on the way home, so Mommy thought maybe we should just stay in the car until he woke up. 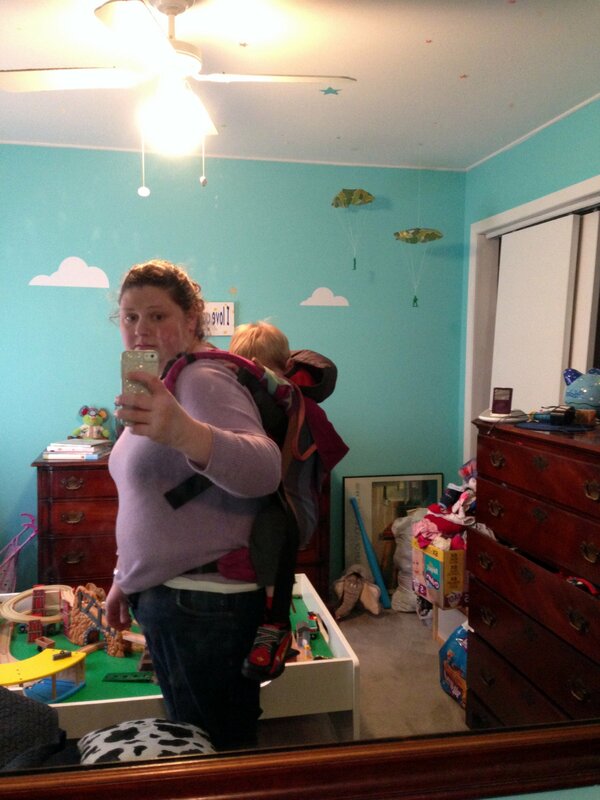 So Mommy hiked Cole up on her back, picked me (and the diaper bag!) up, and sherpa-ed us into the house. Cole took an EPIC nap. Quick question: does everyone have naked time in their house? 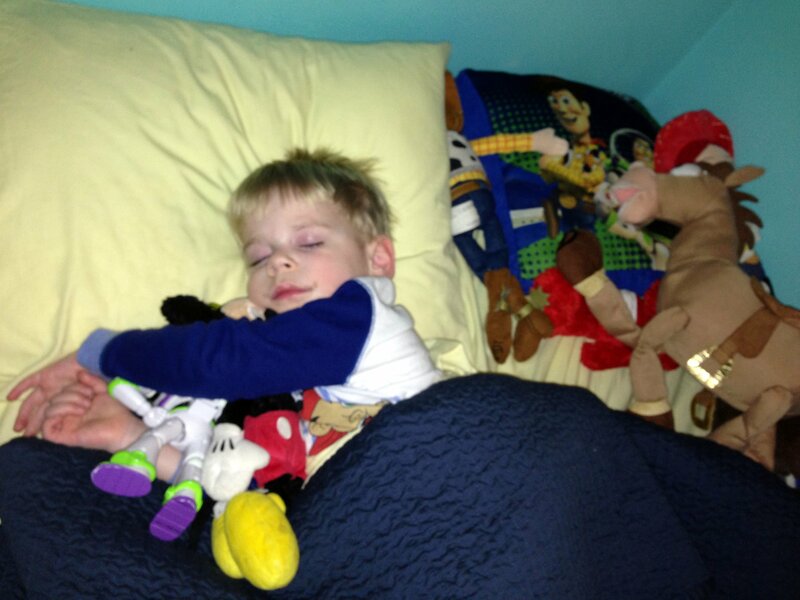 Cole always snuggles up with his guys, but he rotates them so no one gets jealous. 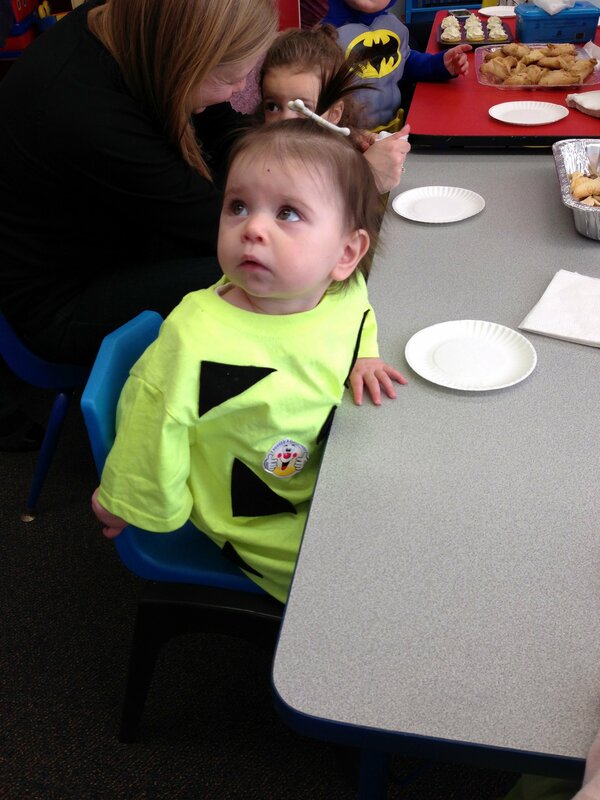 Mommy swears these are the last of the Purim shots; my Mommy & Me class had a belated celebration on Tuesday. 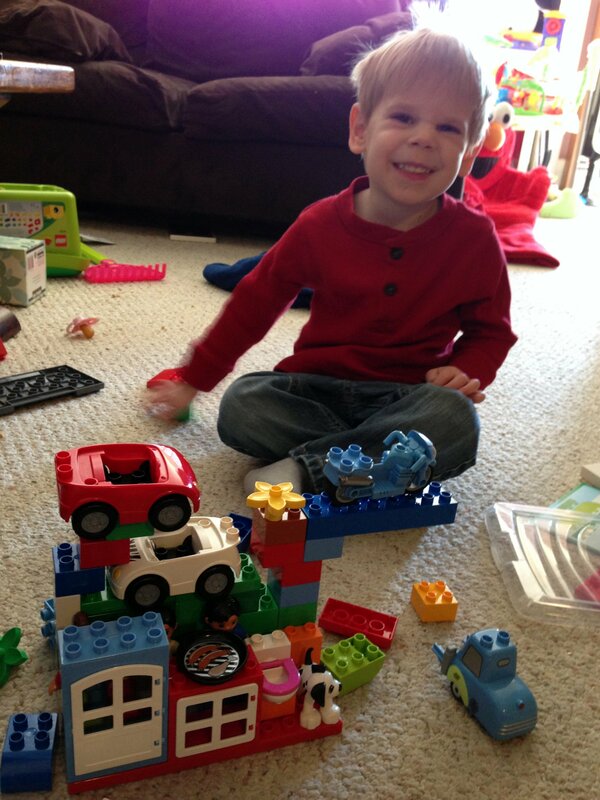 Then, Cole and I played legos. 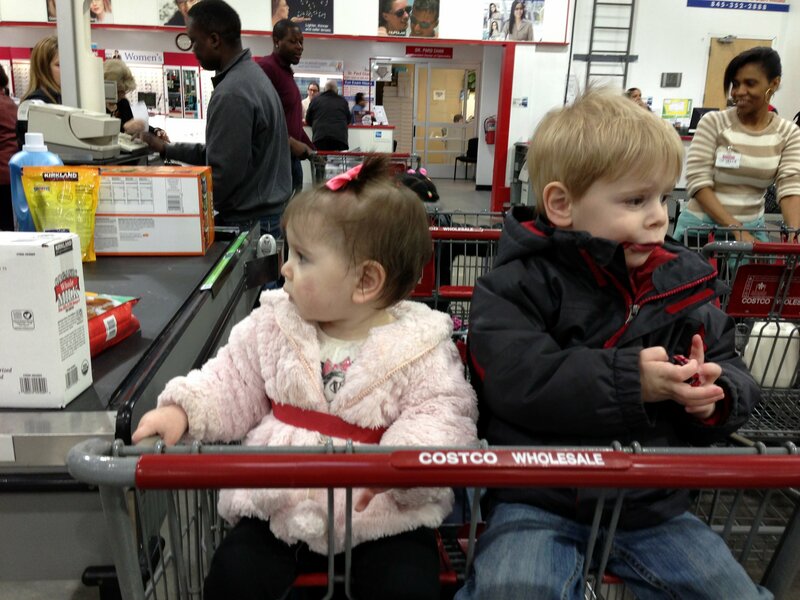 Then, we went to Costco. 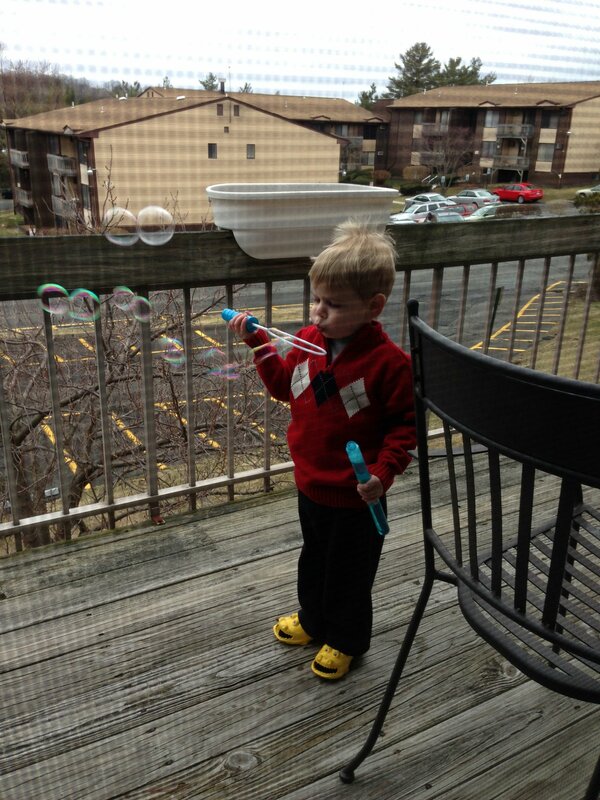 Wednesday was pretty uneventful; Cole blew bubbles on the porch. 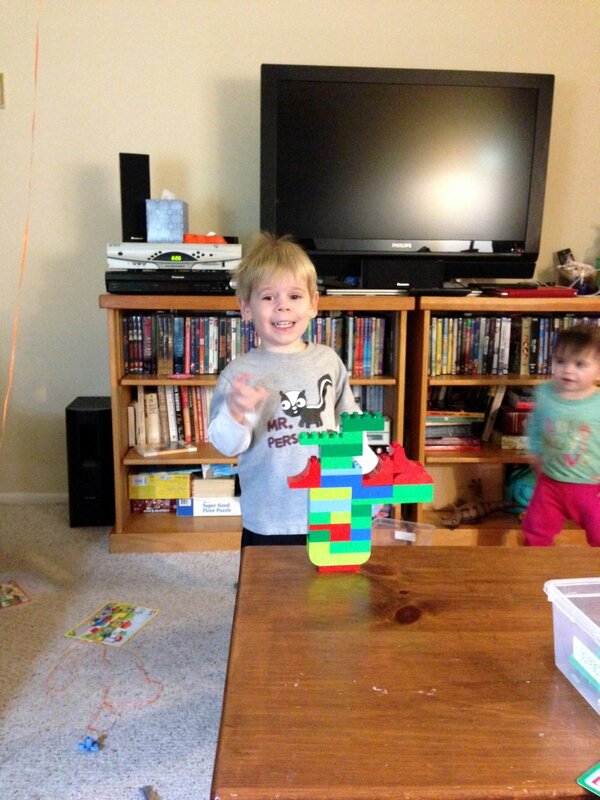 And built another lego boat. If Wednesday was sort of lazy, Thursday was anything but… Well, it kind of *started* lazy. 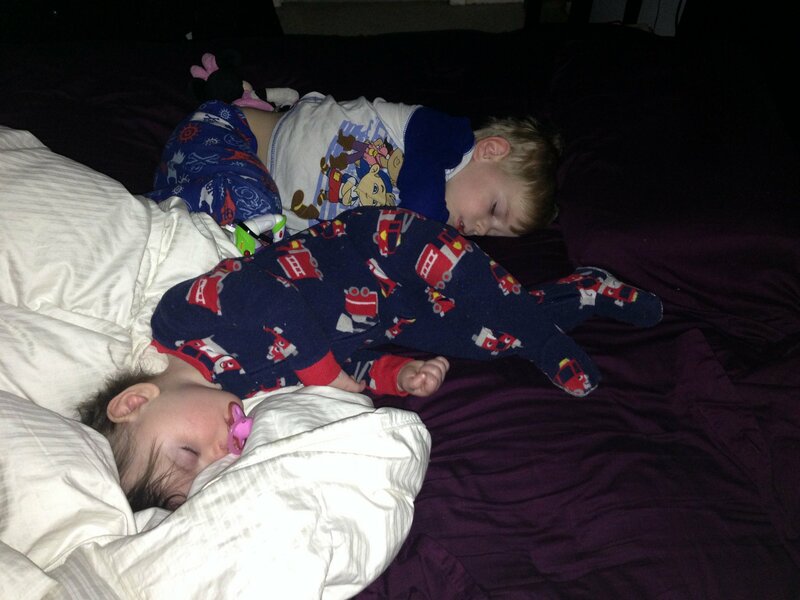 Cole and I took over Mommy and Daddy’s bed. But we got up and shared a quick breakfast before heading out. 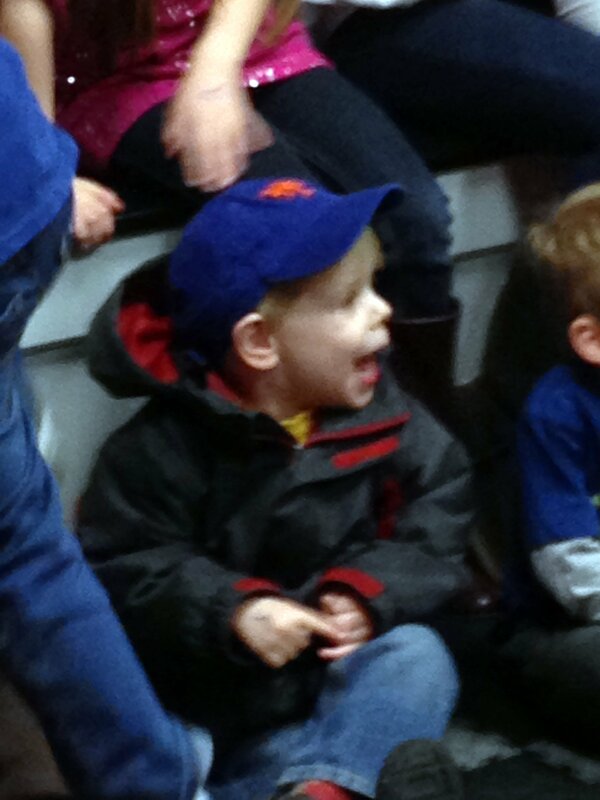 I spent the day with Coach while Cole and Mommy had an adventure. They took the train into the city. 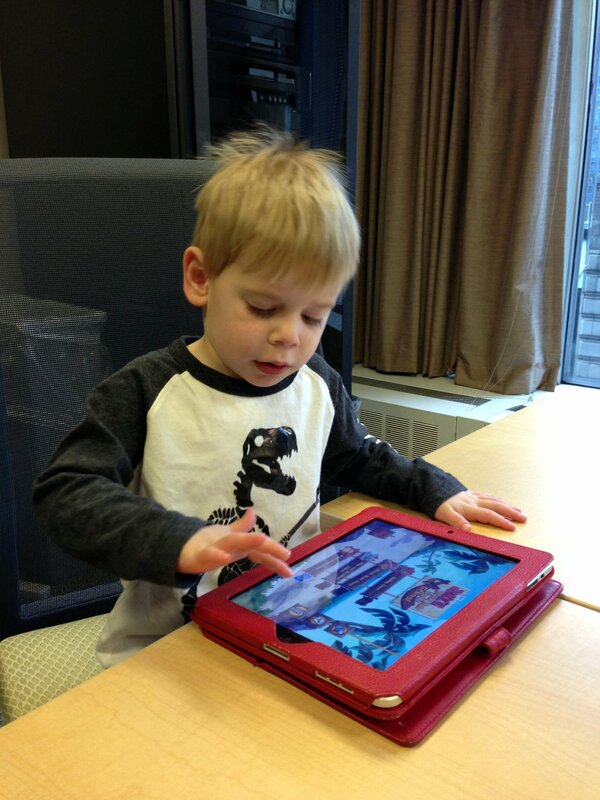 Cole got to participate in a focus group for a new iPad app being developed. 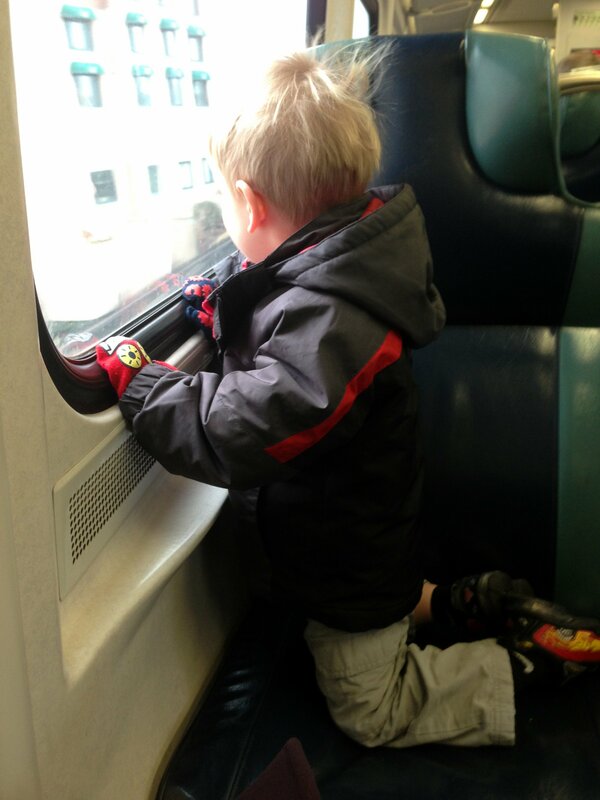 The panel was right across the street from Toys R Us in Times Square, so Cole and Mommy took a spin on the ferris wheel. Aaaaannnnnd the did a little shopping. 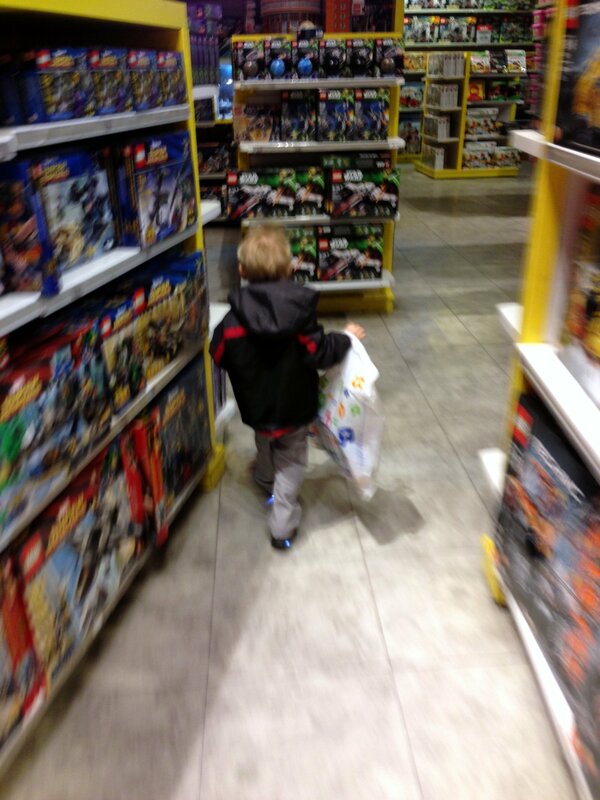 This might be why Cole never wants to let Mommy go anywhere without him. Clearly she is not above having great adventures without one of her children. Ahem. 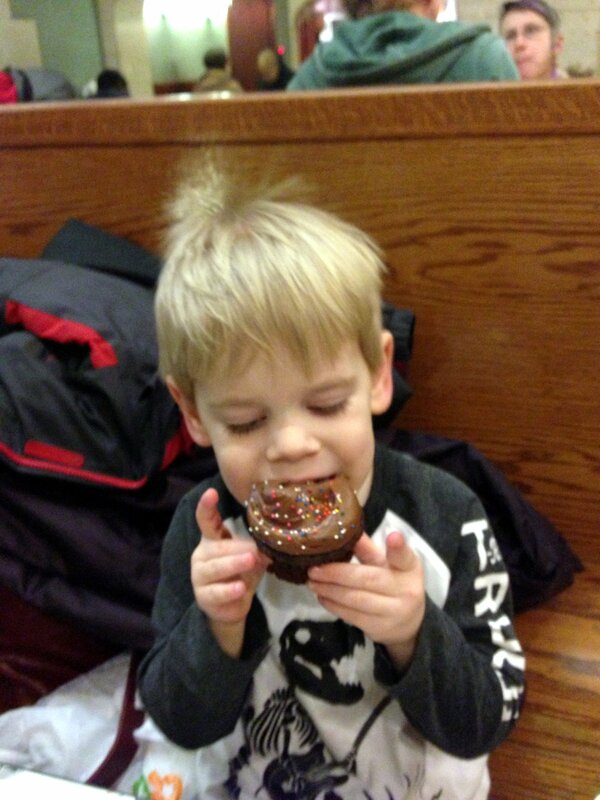 AND he got a cupcake from Magnolia Bakery in Grand Central? Seriously?! Where’s MY cupcake? Snow. We are SO over winter around here. But the weather meant Daddy got to stay home from school. 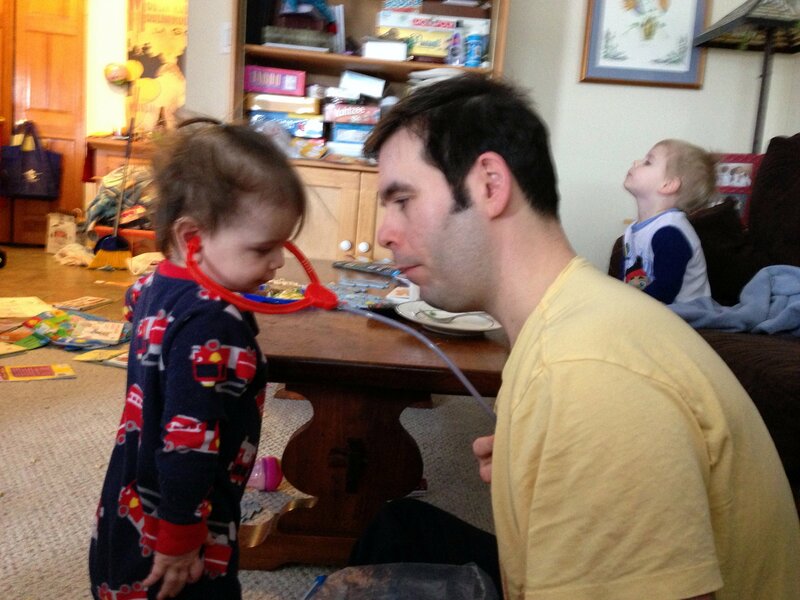 So Cole and I gave him a check-up. Also? 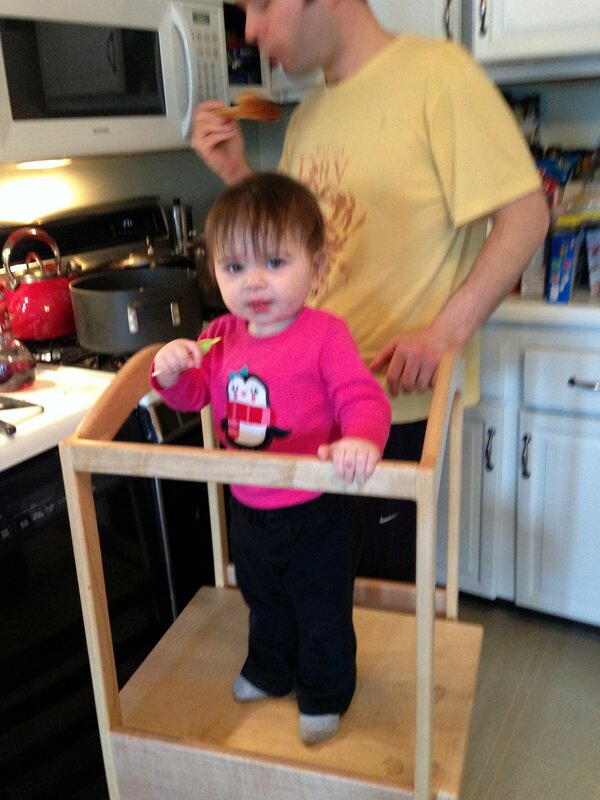 Cole is not the only monkey around here; I can climb up on the kitchen stool all by myself. 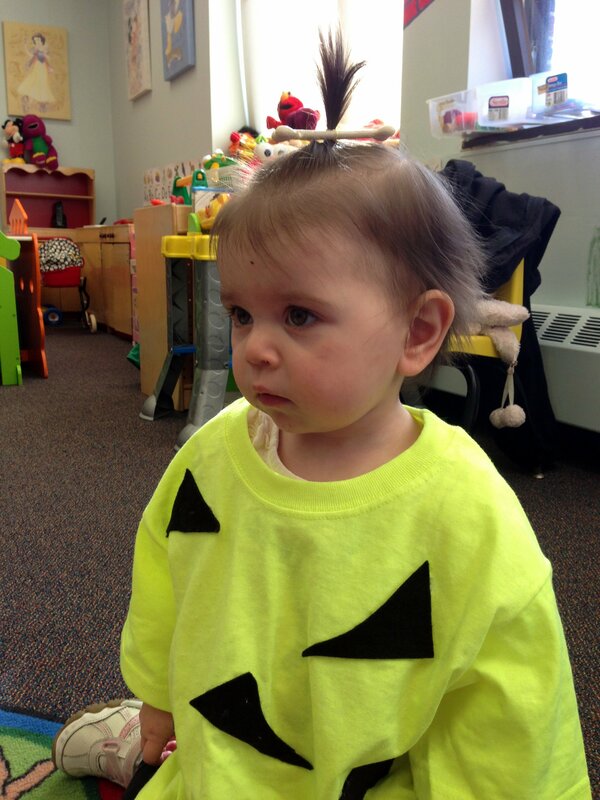 Mommy is less than thrilled. 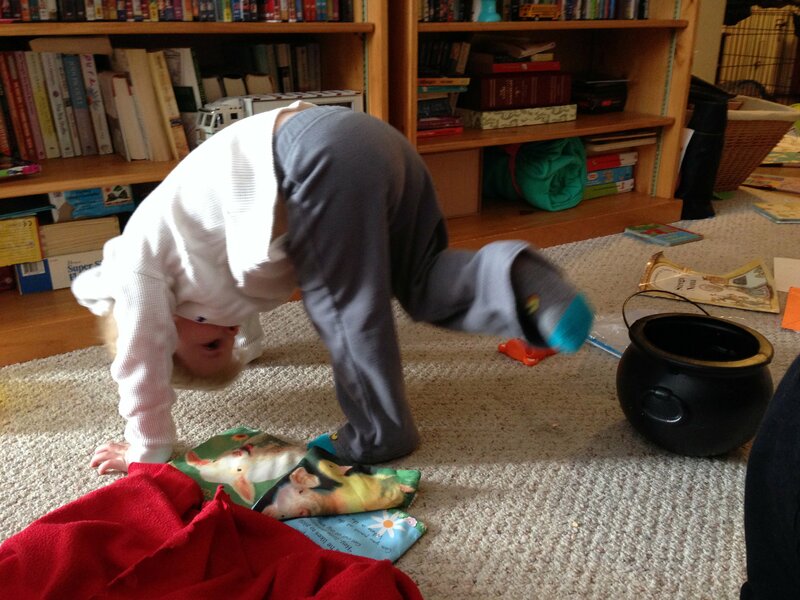 Cole is doing his exercising. 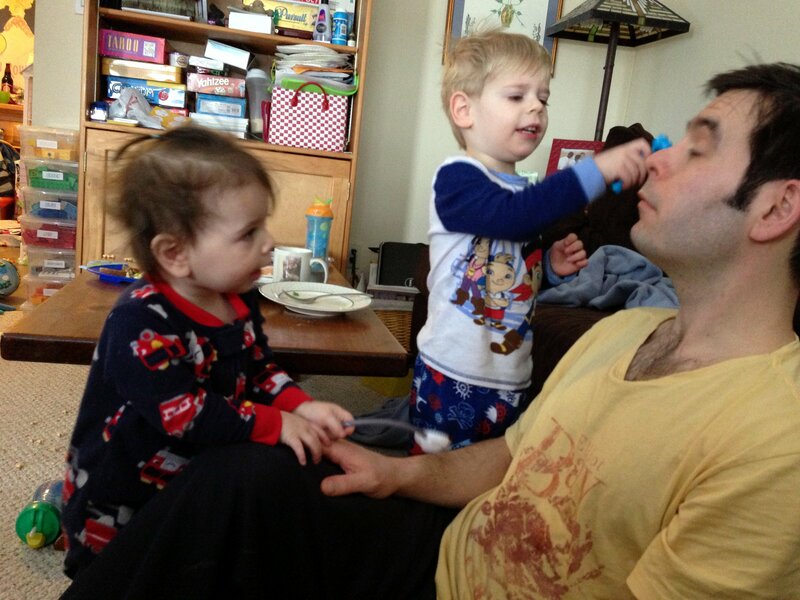 We had a bit of cabin fever, so after Tot Shabbat, we went for dinner. 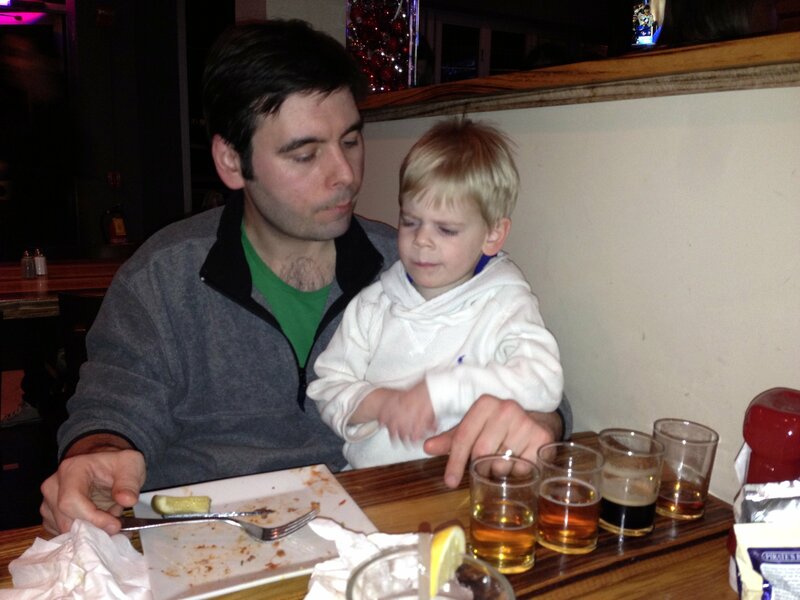 Daddy was teaching Cole all about the different beers in his sampler. Cole was not impressed. 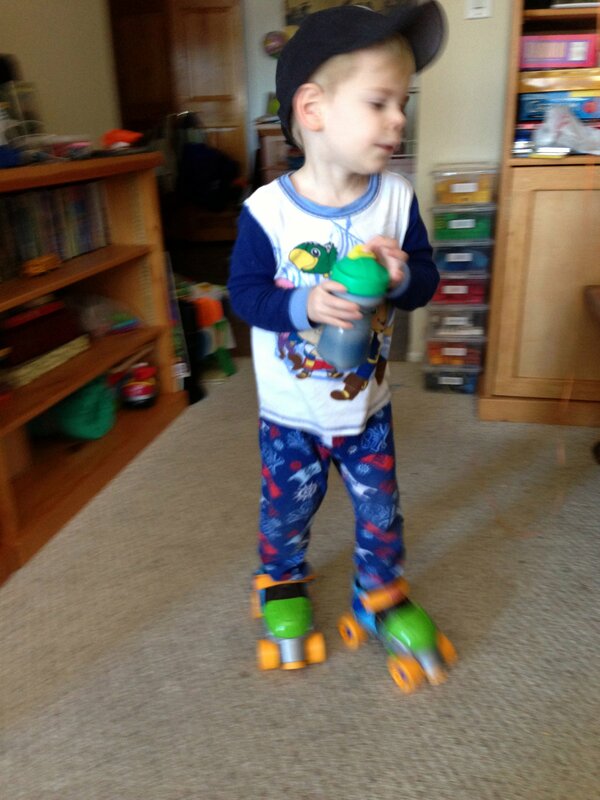 Cole woke up on Saturday in a roller skater-y mood. 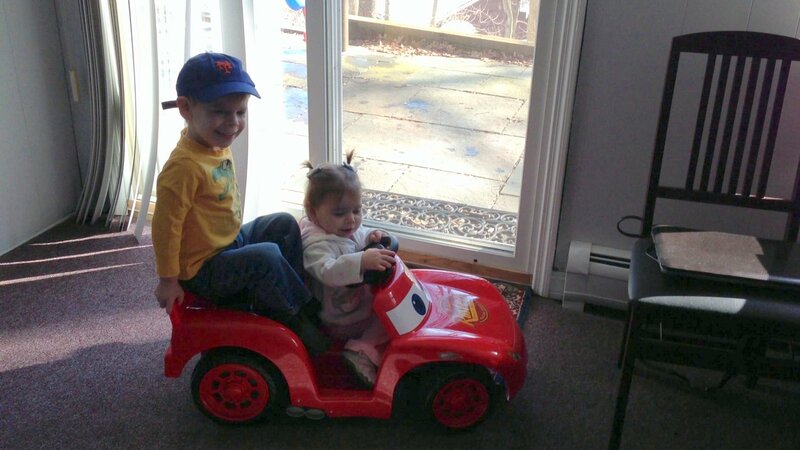 We went to Coach’s house so Mommy could do laundry and Cole let me drive his car. 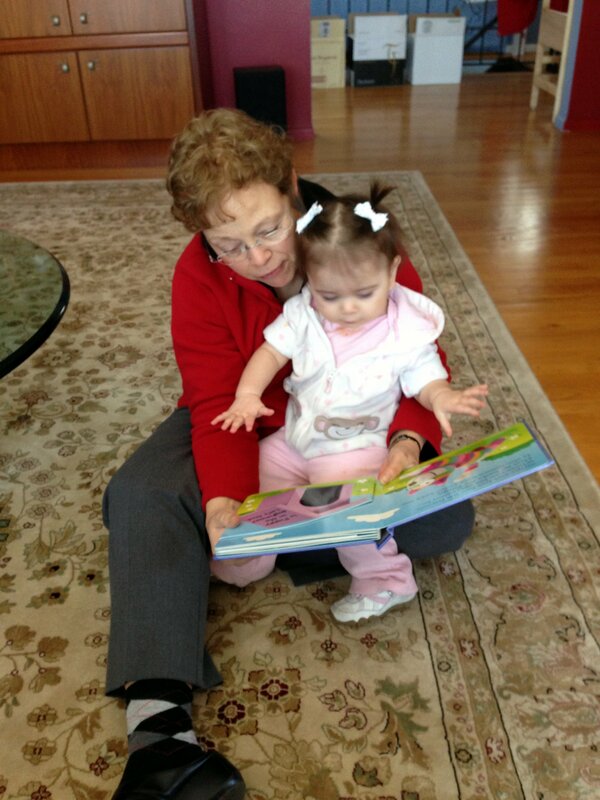 I got to read with Grammy Boo. 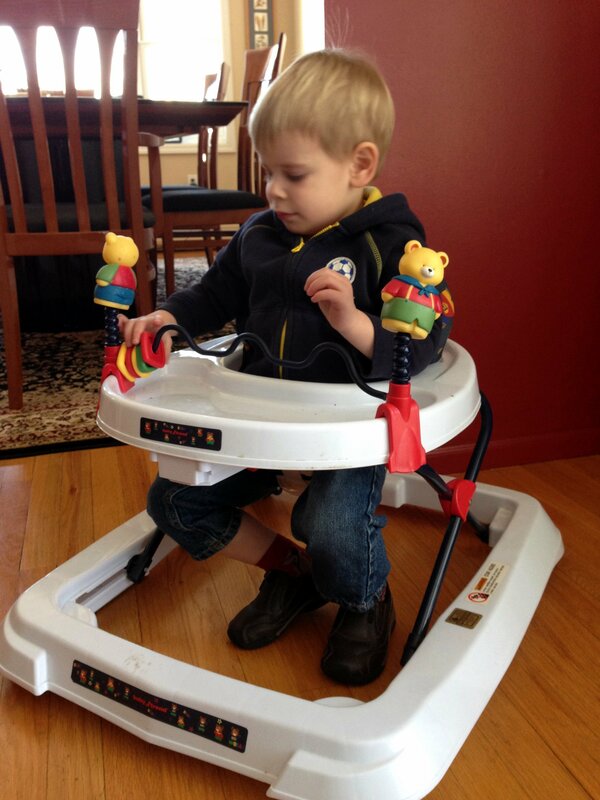 And Cole proved he could still fit in the baby seat. 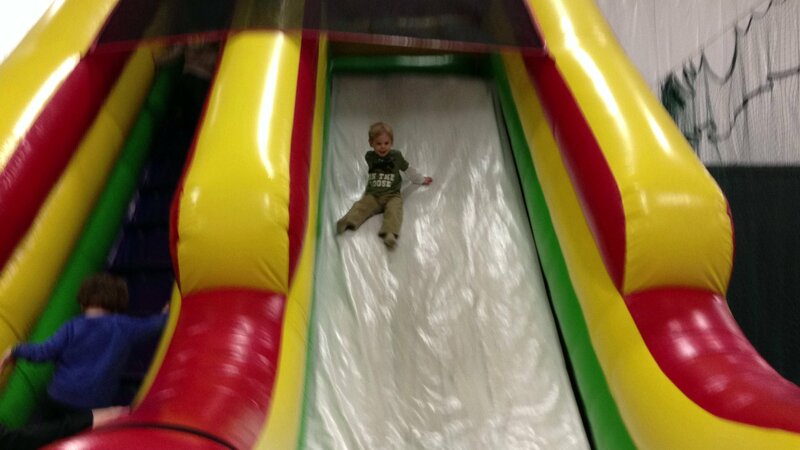 And, of course, we stopped by the birthday party du jour. Mommy went to a friend’s high school musical, so I hung out with Daddy – I was having so much fun, I didn’t go to bed until 10:30! « Come and see me over at Changing the Universe! I LOVE Lulu’s camera shirt. Too cute. p.s. 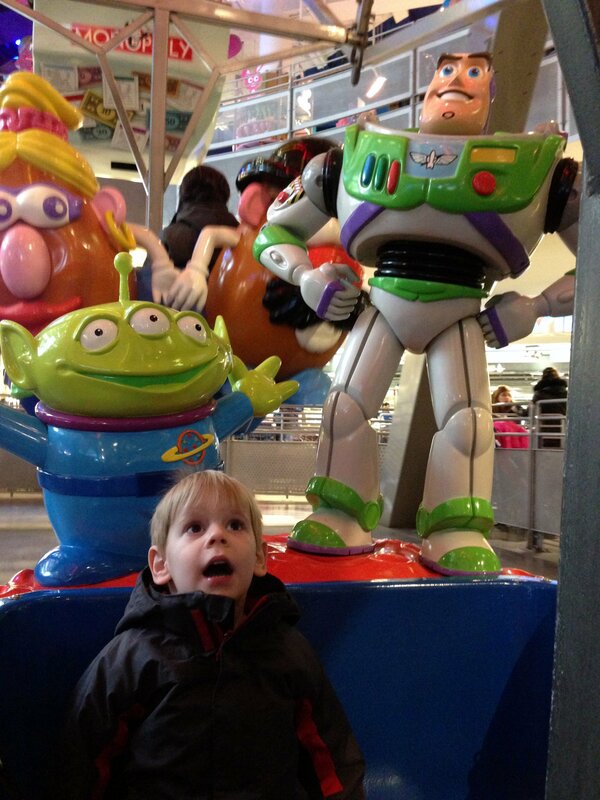 There’s a Ferris wheel in the NYC Toys R Us!??!? Actually, that’s my iPad – the panel was actually for Nickelodeon. I know he’s play the Jake and the Never Land Pirate School app in the pic, but I took that after he was done and we were getting to leave so he was just playing around. 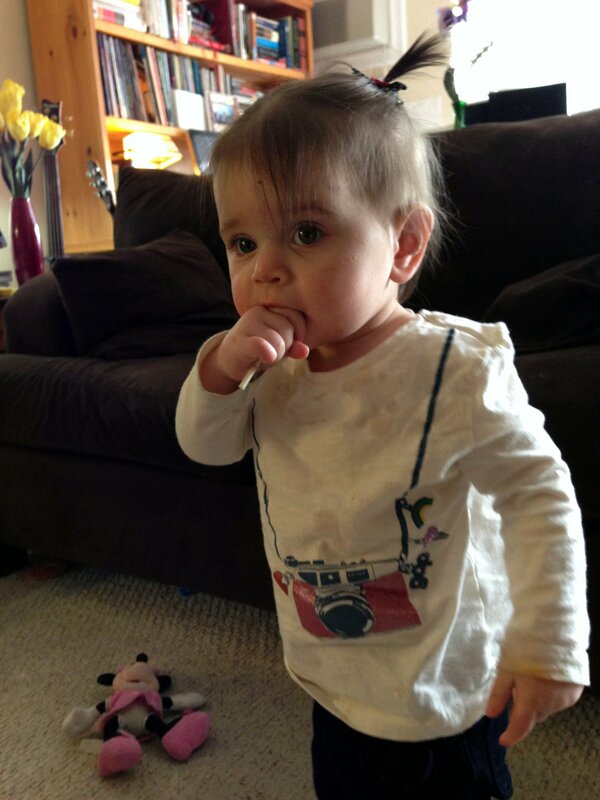 Her camera shirt is Baby Gap, but about 4 years old – we LIVE for hand me downs around here!